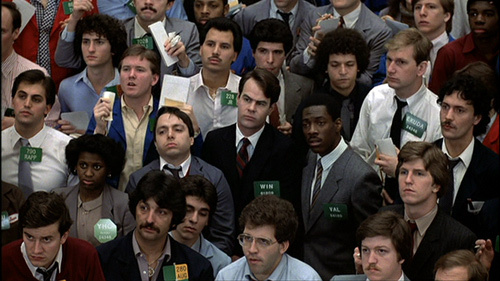 ﻿Trading Places is a comedy film from 1983. 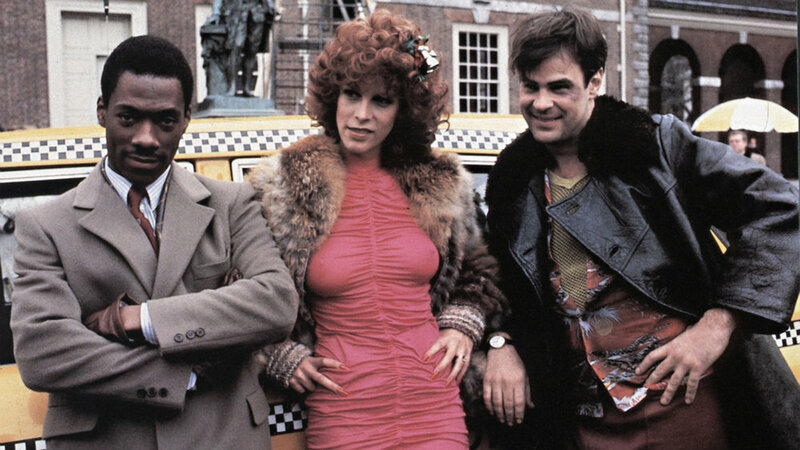 It was directed by John Landis and had an all-star cast including Dan Aykroyd, Eddie Murphy and Jamie Lee Curtis. It’s a loose and modernized take on the Mark Twain tale The Prince and the Pauper. It isn’t just a great comedy, Trading Places is a great movie. It satirizes our society so accurately and relevantly. And it does so with charm. I’ve been a fan of this movie since first seeing it as a kid. My friends and I grew up quoting it in the schoolyard. This high-quality film pairs masterfully with the holiday season especially with a bit of spiced wine. Mortimer (Don Ameche) and Randolph Duke (Ralph Bellamy) are two old and greedy entrepreneurs. They are brothers that own and run the commodities brokerage firm of Duke and Duke. They are horrible rich bullies that play games with young executives at their firm. They make a bet for one dollar to take a snooty, up-and-coming investor, Louis Winthorpe III (Dan Aykroyd), and trade his everyday life with a destitute conman, Billy Ray Valentine (Eddie Murphy). Louis is framed for theft and drug abuse, destroying his life and forcing him into the care of a crass prostitute, Ophelia (Jamie Lee Curtis). Valentine is picked up by Duke and Duke and dropped into Winthorpe’s old life. He goes from a street conman to a well adjusted young businessman. Louis vows revenge on the Dukes and Valentine for stealing his old life. This is my favorite comedy of the eighties. It never ceases to make me laugh. Eddie Murphy and Dan Aykroyd are in top form. The content of their jokes is a bit dated, but it doesn’t take away from the hilarity. Both do a tremendous job. I loved watching a snooty Dan Aykroyd. “... Oh sure, like he went to Haaarvard.” is just one of his amazing lines. Aykroyd just plays a scummy character so well. Jamie Lee Curtis was great too. She broke away from the scream queen moniker that followed her since Halloween. The role of Ophelia gave her the opportunity to broaden her range as an actress. I cannot recommend Trading Places enough. It’s hilarious, and it has a good story. The racial and sexual jokes are a bit harsh for our society today, but they shouldn’t detract from the entertainment of the picture overall. We love rags-to-riches stories that are set in a world we know. Even with the heavy handed, pro-capitalist nature of the film. If you can look past that you will see one of the greatest comedy films of the eighties. A fantastic comedy from Eddie Murphy and Dan Aykroyd. A bit dated, but still highly entertaining and perfect for the holiday season.